Every so often something crosses my path about Supergirl which is unexpected and an absolute treat. This is obviously the work of the master Curt Swan, an artist who defined Superman in the Silver and Bronze age. 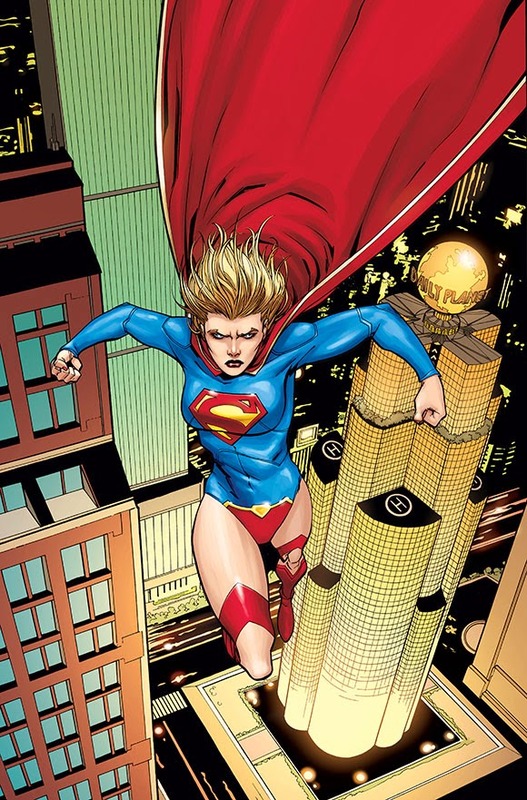 Swan certainly drew Supergirl occasionally, whenever she was a guest star in a Superman story he penciled. But he didn't draw much (if any) Supergirl in the classic Crisis-era Head Band costume! So this wonderful picture of her, specifically in that outfit, with Brainiac 5 by Curt Swan is incredible, like finding a gem! They look so happy! 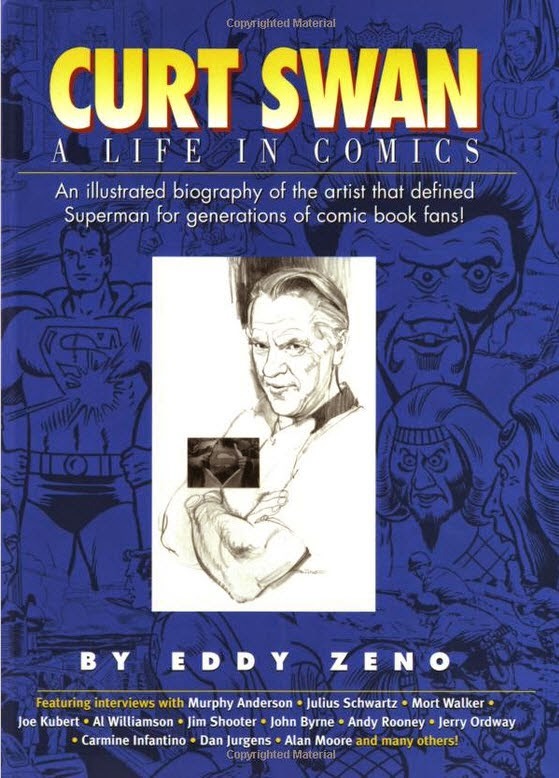 That picture is from Curt Swan: A Life in Comics, a biography of Swan that includes (apparently) many pictures. I don't think I appreciated Swan when I was reading him. I totally appreciate him now. And there is no doubting his contributions to Superman. I just might have to go out and get this book! On a somewhat personal note, he drew the Sand Superman arc, part of which is this panel, my avatar/icon around the net. As I mentioned before, I am away from home this week for some higher learning. I thought that would mean a delay in this week's reviews. But I discovered that there was a comic book store within walking distance of the University. And needing a break from the intense educational experience, I hoofed it there to pick up two books to sate my need for a little escapism. Red Lanterns #31, by Charles Soule and Alessandro Vitti, was one of the books I picked up and continued the impressive Red Daughter arc. 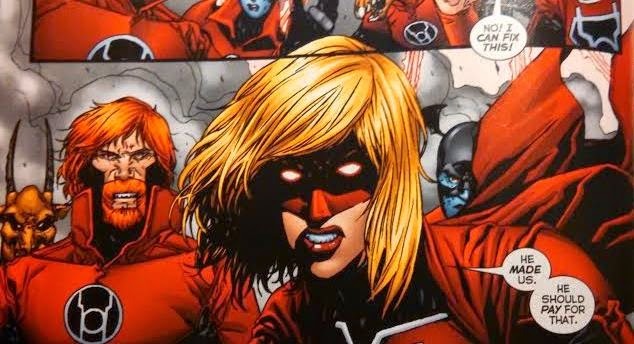 I have said over and over that I don't like the fact that DC dragged Supergirl so far down into despair and rage that becoming a Red Lantern was a natural extension. And I still feel that way. But the truth is Soule (and Tony Bedard) talked how this arc was a transformative and redemption arc for Kara and so far that has been true. 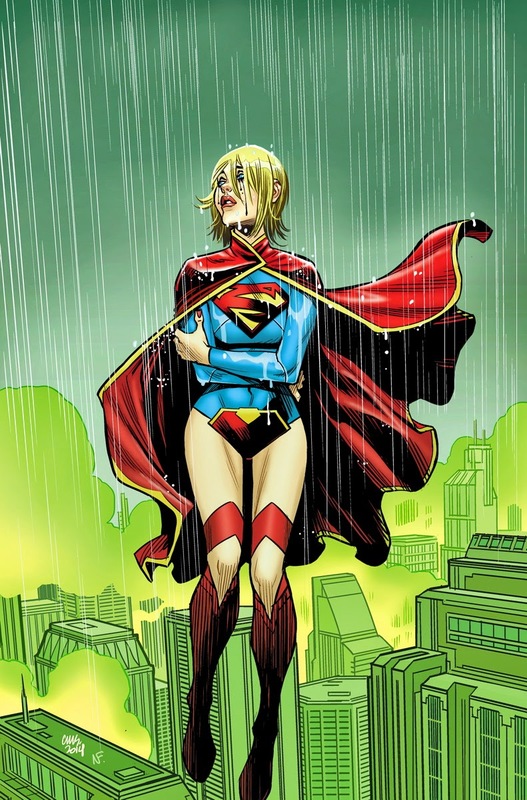 I don't think I have read a more consistently positive and heroic Supergirl in the New 52. Yes that rage ... that fire ... is still there but she is controlling it. And that metal tempered by fire, it is making her into a stronger girl of Steel. I am really enjoying this. And that is high praise ... because I came into this ready to hate this arc. I don't like that we came to this. But so far this story is a winner, especially for Kara. I have sung the praises of Alessandro Vitti before. He is such a natural choice for this book. His art is the perfect mix of detail and grunge for this material. As I am away from my usual tech, apologies for latter panels, pics rather than scans. Remember that the current arc has the Guy Gardner led Red Lanterns (including Supergirl) trying to rein in The Judge, the immensely powerful new Red laying waste to her home planet of Primeen. But Atrocitus is also looking to recruit the judge. 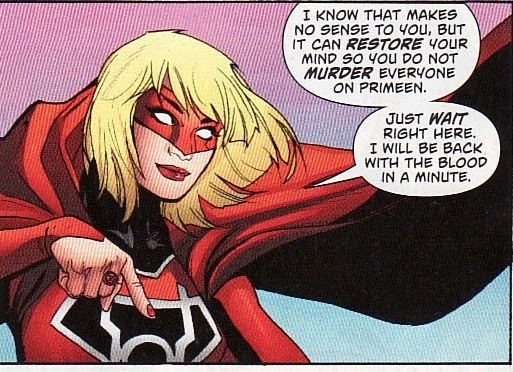 In Supergirl #31, I loved the scene where the Judge read Supergirl's mind and declared her innocent. It was powerful. And it was another brick in the redemption foundation, adding Alura as a role model of strength and perseverance. I am trying to figure out if this scene with Atrocitus makes that scene more or less powerful. 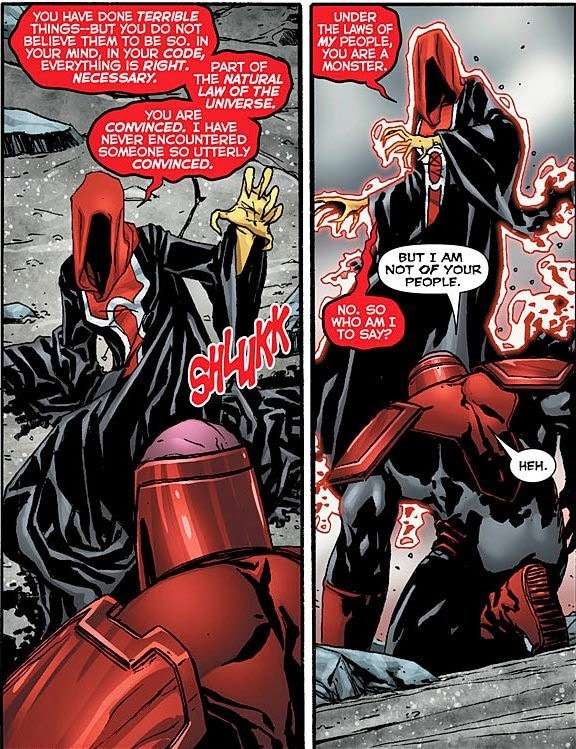 The Judge does the same trick to Atrocitus, finds his deeds terrible (even if he doesn't) but says she can't judge him because he isn't from Primeen. So how/why did she judge Kara. Is she so innocent that she felt she could declare it? Or is it made less meaningful because the Judge didn't execute Atrocitus? Thoughts? Unlike the sulking, brooding, angst-ridden we got in most of her solo title, since Red Daughter we have had a proactive, 'let me help', thinking Supergirl. With the 'good Reds' trying to figure out how to immerse the Judge in the Ysmault lake blood, Kara says she can handle it and flies off. This is the sort of Supergirl I like. She is a young hero. She wants to help. And she acts quickly ... sometimes too quickly. She is still learning. But it is clear from early on in this issue that Guy is a bit paralyzed. He is trying to figure out just what to do. I like that Supergirl decides to act rather than wait. And I love her solution ... even if is messy. She takes the tank of lake blood and rips it open over the city that Atrocitus and the Judge are in. The blood rains down. I am new to the Red Lantern world. I was under the impression that you need to be immersed in the lake. Is a spring shower enough exposure? Have we seen this before. This is a great panel by Vitti ... visceral and powerful. But this solution doesn't exactly work. While the Judge seems to collapse, Atrocitus is able to control the blood, gaining power from it, and making it into a maelstrom. This might be my favorite panel of the whole book. Guy's Reds don't know what to do with this blood tornado. But Supergirl, maybe feeling a bit guilty because she gave Atrocitus this weapon, again leaps forward and says she can fix it. Once more, proactive, heroic, thinking of what is right. But this line saying that Atrocitus needs to pay for creating the Reds. That's pure character gold. It shows Supergirl isn't embracing this. She doesn't like the existence of Reds. She wants the villain to pay. It shows me that, given the opportunity, she would leave this life. This is the learning Supergirl. While I like her leaping to action, she is still young and learning. She is making mistakes. Her way to fix the blood storm is to ignite it with heat vision. The result conflagration sets the city on fire! And the Reds give her some tough love. This is another great scene! First Bleez tells her she needs to grow up. She can't give into the ring; she can't just fly off on an impulse. It is a lesson. And friend or no friend, Bleez needs to teach it. But I still wish it was Clark guiding and teaching as a family member. Luckily Guy's gang are able to use 'magic' to will the blood whirlwind away. A bit easy and odd, but I guess I'll roll with it. With the fire out and the blood gone, all that is left is a showdown with Atrocitus and to see who the Judge will join. But Atrocitus has an ace in the hole. He has Rankorr. And he will return Rankorr if Guy allows the Judge to join Atrocitus. I like what Soule does with the Judge. She doesn't have enough information about either side to judge who she should join. And she needs to judge herself on the harm she has done. She removes herself from the game, going off for self-reflection. We just met this character but somehow that feels completely appropriate for her. (It also removes a powerful Red from the board ... keeping the status quo.) Still, that is good characterization. But finally, after a whole issue where I think Guy either sat back or simply reacted (rather than acted), he finally shows some of that fire. 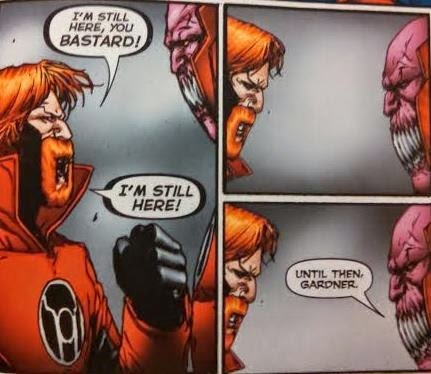 He reminds Atrocitus that despite everyone who has gunned for him, he is still around. That is pure Guy. And I love him staring down his enemy. Perfect. The two groups of Reds separate. Their fight will happen some other day. Despite stopping the Judge, the resulting fallout is a devastated Primeen. Even some of the moves they made (like Supergirl igniting the blood) added to the mayhem. With the conflict over, the Primeen citizens beg the Reds to leave. Look at Supergirl frown when she realizes that despite her effort she isn't one of the good ones yet. But this is a frown. Not a scowl. No a glare. Not a sulk. This Kara wants to be a good one and is disappointed if she isn't. I don't think this will discourage her. I think this will motivate her. And with Guy and Bleez there to sort of set some rules, it seems like she will grow. I know I concentrated more on the Supergirl portions of this issue. But this was just another step on her journey to re-enter the super-hero world. And despite liking the camaraderie, I don't think she is too thrilled about this life as a Red. I don't think she imagined this would be her. She wants to act, help, be good. And while this life can get her there, it won't lead her there easily. I have to applaud Charles Soule for giving us this Kara, dealing with her loss initially through rage but growing too, maybe moving away from it. And Bleez, the Judge, even Guy - all those characters feel well-rounded and real. Add to that some very compelling art by Vitti (he really draws a fantastic Supergirl) and you have a winning issue. I have been relatively pessimistic about DC comics for about 4 years now, watching them turn a bright universe into one that is perpetually and disturbingly dark. I have watched then tarnish their heroes and polish their villains. I have watched editors bully creative teams to the point creators have left the company. And I have watched as sales plummet. And in the latest batch of cancellations, DC axed 6 books: Batwing, Birds of Prey, All-Star Western, Superboy, Pandora, and Phantom Stranger. It is sometimes hard to be a fan of this company. Now I usually review only the super-titles here but the happiness was found in two unexpected places at the top of the list. Okay, I will admit that I am a Grant Morrison acolyte and he has rarely let me down. 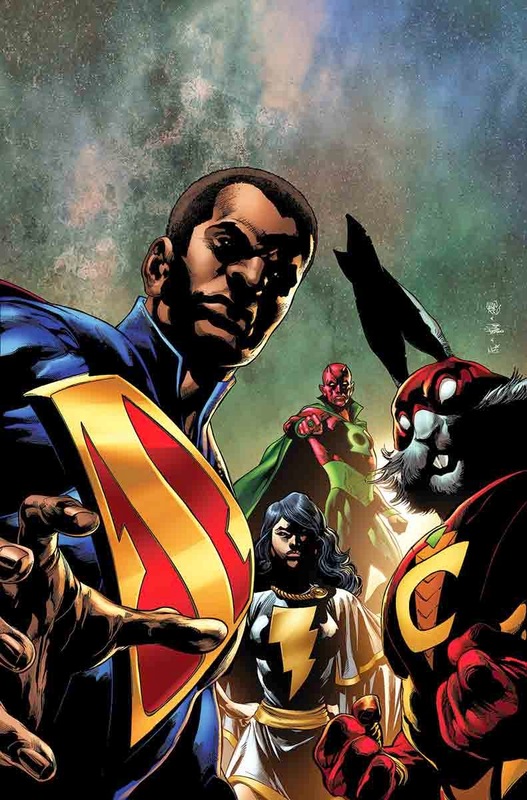 I have been waiting for Multiversity since it was rumored so to see it actually solicited is downright awesome. And with a bunch of non-mainstream characters to play with, I anticipate some Morrison lunacy at its best. 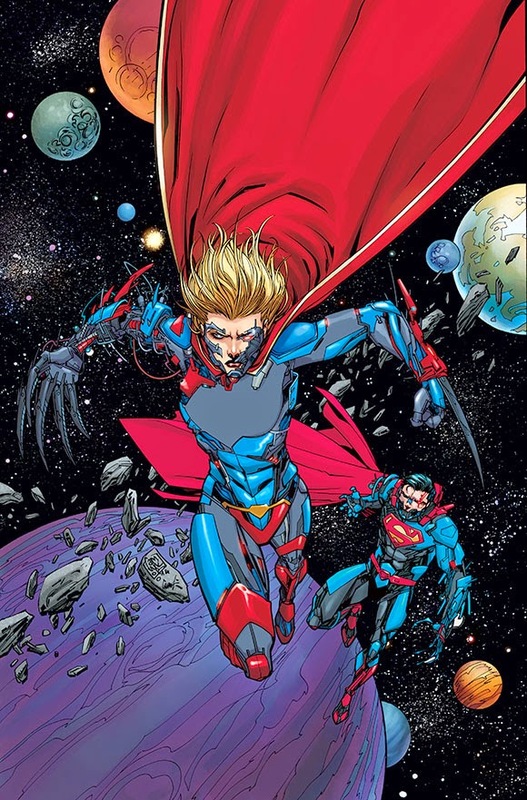 It will be especially nice to see Earth-23 Superman again. But this might be the best news I have read in a long time. 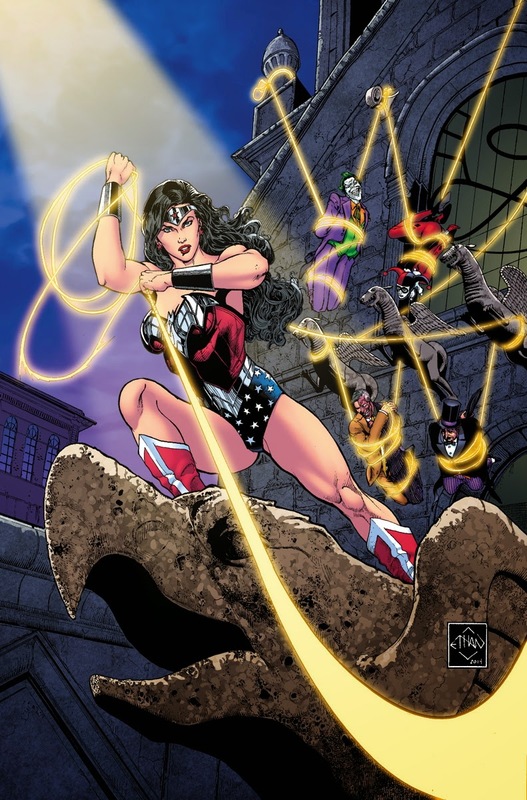 DC is putting out a Digital first Wonder Woman book! And it will have a print form for old-timers like me! I have absolutely adored the 'out of continuity', more classic, more inspiring stories I have read in the digital first Adventures of Superman so I am hoping that I will get that same feel from this book. But this is fantastic ... dare I say Wonderful ... news. Okay, on to the super-books. I am thrilled that Supergirl is back in her S-shield costume and part of the Doomed arc. She is part of the super-family again! Not too much her to contemplate in the sparse write-up. But that Cam Stewart cover is beautiful. And now “Last Sun”, the penultimate chapter in the “SUPERMAN: DOOMED” saga as Earth lies in ruins and everyone’s survival is in question! So, any ideas how Superman gets cured of this? Will he truly demolish the world? Will this further strengthen the 'humanity hates and mistrusts Superman' sentiment? I trust this creative team a ton. 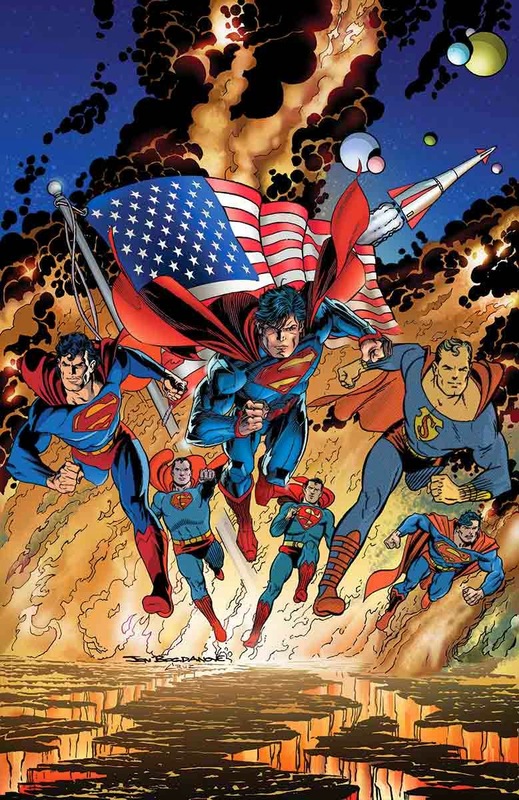 Geoff Johns and John Romita, Jr. continue their epic Superman run with “THE MEN OF TOMORROW” chapter 3! Introducing the bizarre villain known as The Machinist – the man behind the recent technological attacks on Metropolis. But what is his strange connection to Superman? Where is he from? And what does The Machinist want with The Daily Planet? Plus, the mystery behind the disaster at the Ulysses Research Lab sends Clark on an investigation that will reveal a dark secret from his past. So by this time we'll get a sense of the type of story Johns will be constructing. The Machinist has a strange connection to Superman? Could Johns be linking to the tech-stone in Superman Unchained? I wouldn't mind some sort of linkage to make Unchained firmly in continuity. I do hope that Johns writes Superman like he did several years ago. The group brought together to stop Superman is an interesting group. I am thrilled Supergirl is in there. I wonder how Lashley will draw her. Hopefully, since this includes Brainiac, it concludes his arc and returns Lois to normal. I can't think of how Brainiac can cure him. Nice charged cover by Tony Daniel here. The force of Brainiac? Could this be the suddenly awake people of Kandor? Could they be working for Brainiac now? Shame Daniel isn't doing inside art. But Paulo Siqueira is a fine replacement. Part 2 of “Forgotten Heroes” finds the new team of Catwoman and Superman taking on Gotham City – and there’s nothing Batman or Lois Lane can do to stop them! I like the 'switch' of partners here. But Lois?? 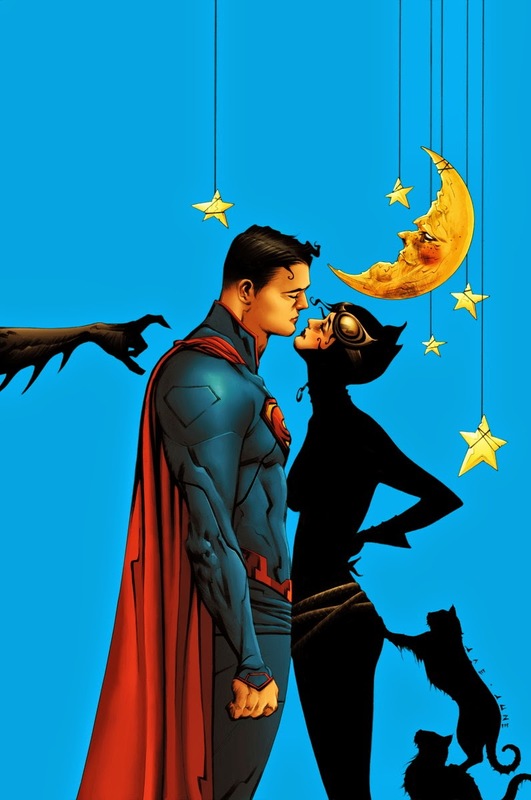 Could Pak be ignoring the Clark/Diana romance? Jae Lee hits it out of the park with this cover. 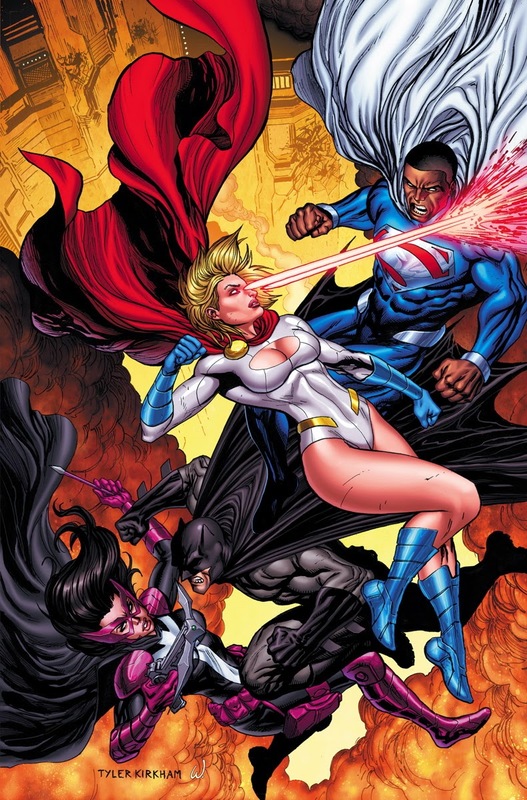 Power Girl and Huntress return to Earth 2 just when their homeworld needs them most! I think Tyler Kirkham is great so I look forward to seeing his take on these characters. Equinox sure gets cover space. I suppose this could be the first time we see a lot of her. Hopefully Supergirl will be present and accounted for by this issue. And a 4 issue opening story! Hurrah ... not padded to make it to 6! I can remember people gushing about this when it came out digitally. And I have been waiting patiently. But that is an amazing group of artists lined up. When Lex Luthor attempts to invest in Ted Kord’s new experiments, the scientists working on the supercollider are skeptical. But Lois Lane is at the Antarctic compound to cover scientific achievement, not corporate espionage, so it’s not until things go massively awry that her fiancé gets sucked into the action! A new Smallville arc.And Ted Kord is a big part of it. More universe building. Excellent. Could this cover be teasing 'red skies'? I can't wait for this! 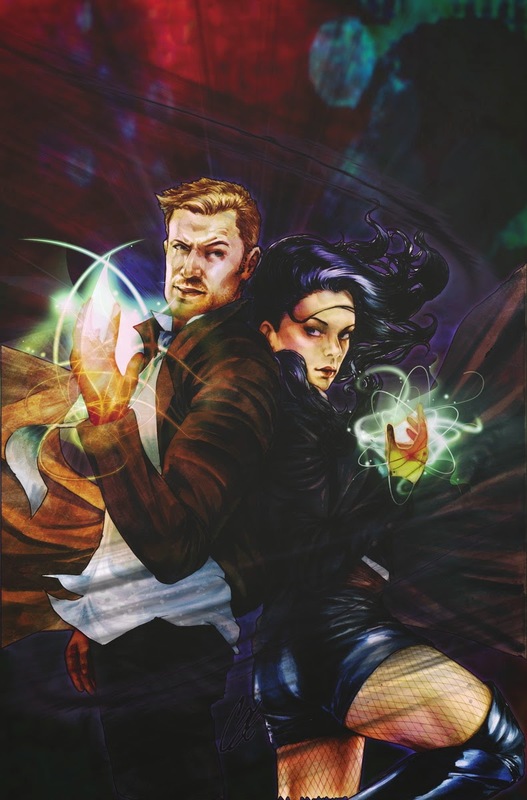 Zatanna and Constantine in the DC Smallville universe. And that is one beautiful cover by Staggs. I suppose this will be a stand alone. But it will be good to see these characters in this book. That means Zatanna may be part of the Crisis! So that's a lot of books! 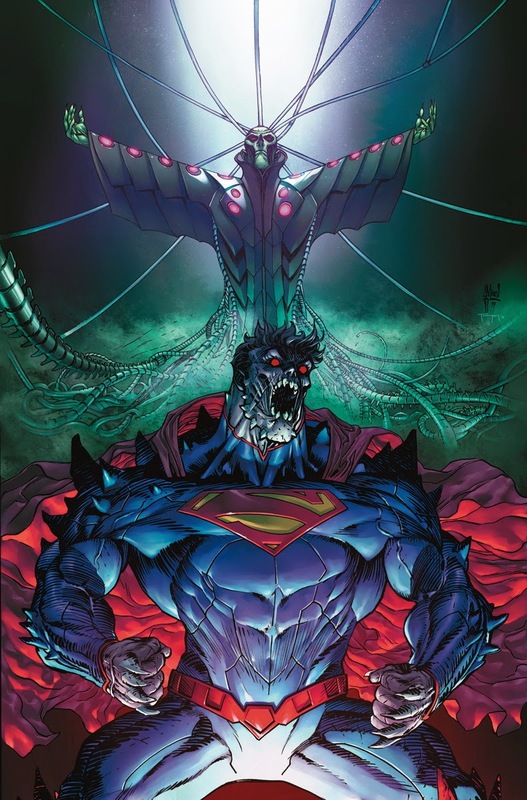 Batman/Superman #11 came out last week, the third chapter in the Doomed story arc. Knowing the August solicits we are really just at the beginning of this arc. There 3 ... three(!) ... more months of this. That is a bit crazy! As a third chapter, this one does it's job. We learn much more about the background of the Doomsday attack. We learn about the origin of Doomsday leaving the Zone. There is a fair amount of exposition/plot progression but never by sacrificing the action. That is appreciated. But for me the best thing about this issue was how well Pak shows us how Superman is an inspiration or at least an influence on the heroes and people around him. I don't know if I have seen or heard that in the New 52. As an long standing Superman fan, I like him being the brightest light in the universe, the light others strive for. The art on the issue is a mishmash by Tom Derenick, Karl Kerschl, and Daniel Sampere. All have a nice style and the differences aren't so jarring as to knock me out of the story. I commented how much I have been enjoying these opening recap pages done in the style of the Daily Planet. However reading this one, I think I missed have missed Doomed Chapter 2.5. 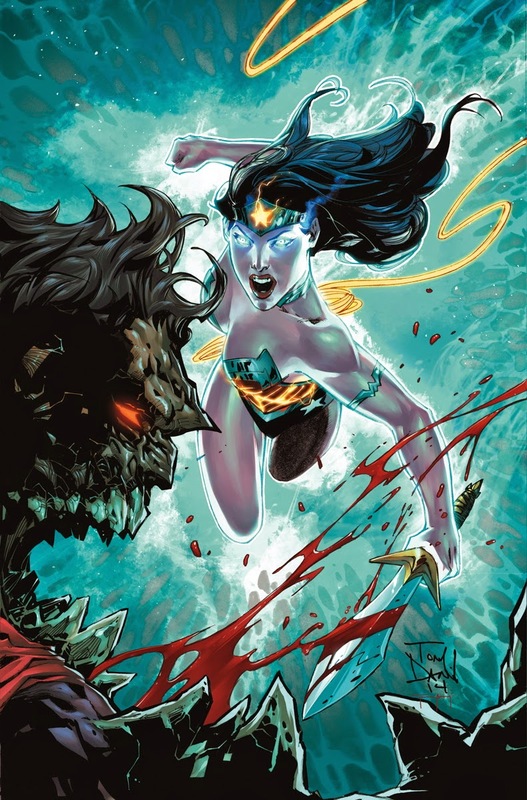 The last chapter in Superman/Wonder Woman #8 ended with Superman somehow willing the Doomsday germ inside. He was cradled in Diana's arms. This says that Superman, in semi-Superdoom mode, went on a rampage in Metropolis. Did I miss something? Batman, Wonder Woman, and Steel all decide to team up to help find a cure for Superman. And they have to act fast. 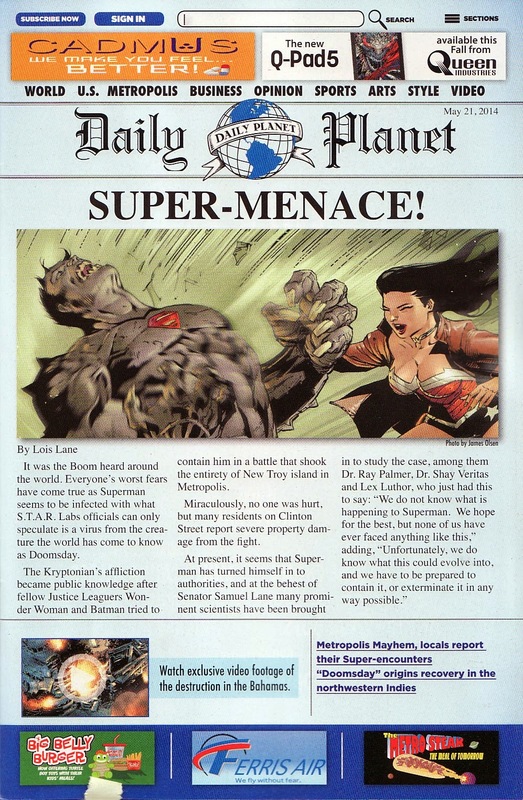 In the media-saturated world, Superman being a monster is big news. What better way to get ratings than to whip the public into a panic, terrified of their hero. Even Batman knows that these terror tactics work. Already we begin to see how important Superman and his image is to Batman. He knows he has to bring this problem to an end and soon. He, Wonder Woman, and Steel all head to the Fortress to try to find a cure. When I read Action Comics #31, I saw a panel where Krypto licked Superman's hand and at the time I wondered if that was a key. Wouldn't Krypto get the virus? Maybe him having the disease will help people figure out a cure? Well, Krypto is indeed pretty sick when the heroes arrive in the Arctic. 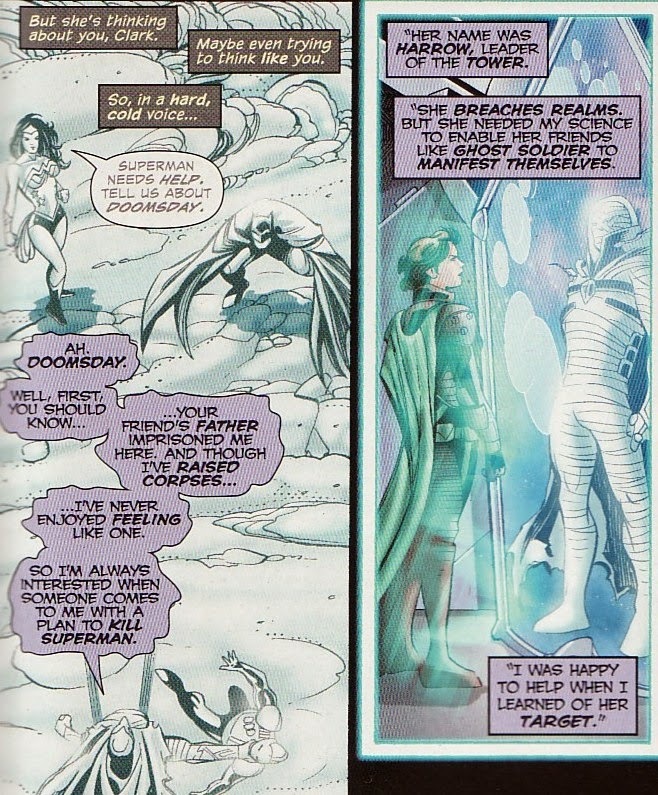 The heroes think it must be from the proximity Krypto was to Superman, that 'Doomsday plague wave' that made everything die around the original Doomsday. But I think this is because he has the virus as well. Will see if that plays out. A suddenly spry Krypto does bound about the Fortress and ends up jumping into the Phantom Zone. And Batman immediately assumes that Krypto is trying to tell them something. But that something is that he is on the trail of Doomsday. 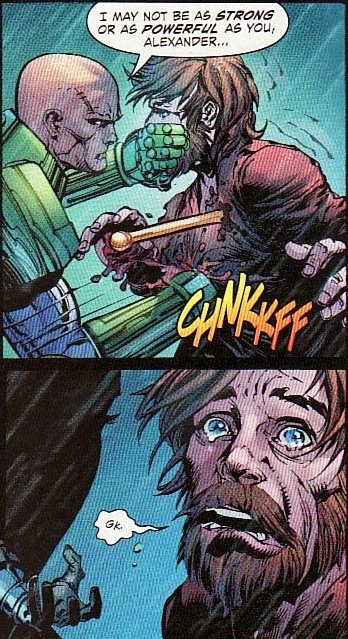 Umm ... didn't Batman see Doomsday get ripped asunder? How can you be on his trail when he is dead? And there is a little bit of Lassie here. Lassie barks and the owner knows the dog is saying Timmy fell down the well. How does Batman know what Krypto is thinking? But I am nit-picking. What I liked about this panel was what Batman is saying. Batman is thinking of Superman fighting this disease. He thinks about what might happen if Superman succumbs. With his friend suffering, he is willing to jump into the Zone with Diana. But he does tell Steel to stay out and shut things down if any villains try to escape. The Zone seems off. There is some solidity to things, including the heroes. And that makes them easy targets for all the villains still in the zone - Mongul, Non, and others. In fact, those villains are trying to seal a rift between the Zone and Earth, perhaps the very rift Doomsday went through, a rift pouring energy into zone, changing its properties and killing those trapped there. But Diana and Bruce aren't the only ones in there. The Ghost Soldier arrives and just in time to make the heroes intangible, saving them from Mongul. And under the influence of Diana's lasso he states he has left the Tower. He can't believe the Tower helped release Doomsday and he wants to make amends. I said I liked how the heroes here are comparing themselves to Superman. Despite being saved by the Ghost Soldier, Batman attacks him. He says that he isn't Clark. The search of the Zone leads Batman, Diana, Krypto and the soldier to a large Kirby-looking device which seems to be generating the energy causing the rifts. And right nearby is Dr. Xa-Du, the phantom king, the first prisoner. We last saw Xa-Du in Morrison's Action arc, a member of the Revenge Squad. We know that his 'ectoplasmic' bandages allow him to be solid in the Zone and on the outside as well. Here he is wielding a pretty big gun and he doesn't seem to happy. We really don't know too much about this Xa-Du. The original was introduced way back in Action Comics #283, a physician who killed his patients when he experimented on them. Hopefully we'll get some of his backstory because he seems to be a big part of this story. 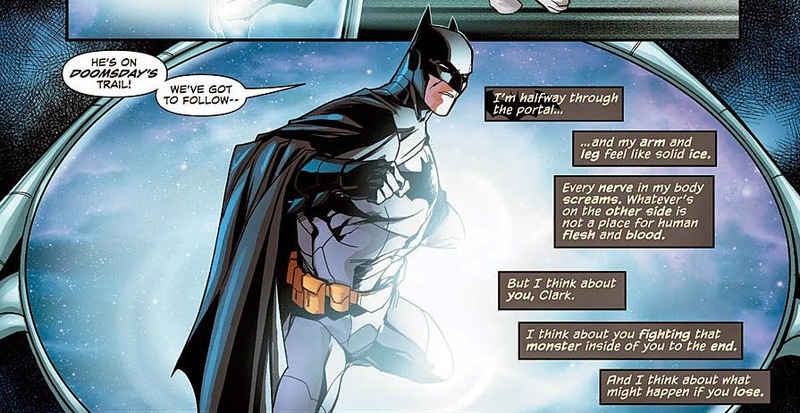 We have heard how Batman is thinking about Superman, comparing himself to Kal. Now we see Wonder Woman doing the same thing. 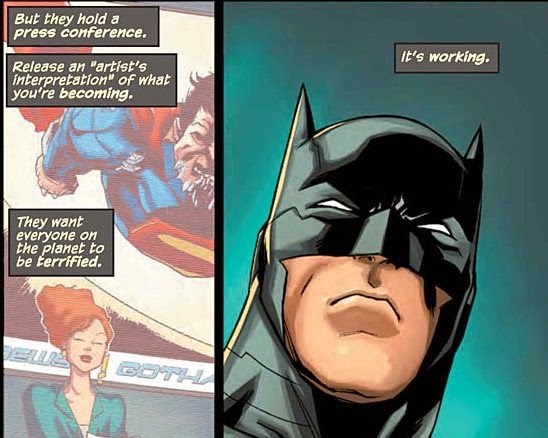 Batman can see that Wonder Woman is trying to think like Superman. She doesn't jump to the sword and tries to gather info. I like that, that even Diana is willing to strive to be like Clark. It turns out that Xa-Du was recruited by Harrow to help bring about Superman's end. And thirsting for revenge he acquiesced. He freed Doomsday from a Zone within a Zone (a pocket Zone?). So Xa-Du helped create/manifest/substantiate the Ghost Soldier? Fascinating. And Harrow is also way more interesting now. How did she know about the Zone? Who is she really? Part of the problem of releasing a monster is that you don't know how monstrous it has become. The released Doomsday was something different than Xa-Du expected. Doomsday broke the Zone. Superdoom will kill everything. Xa-Du wants to kill it. And he has a big old gun to do just that. According to him there is no cure. So there is the exposition. Who made the Ghost Soldier? How did the Tower know about Doomsday? Who released him? Xa-Du has a pretty big part to play in this. And, knowing that Diana and Bruce subdue him to bring him out. 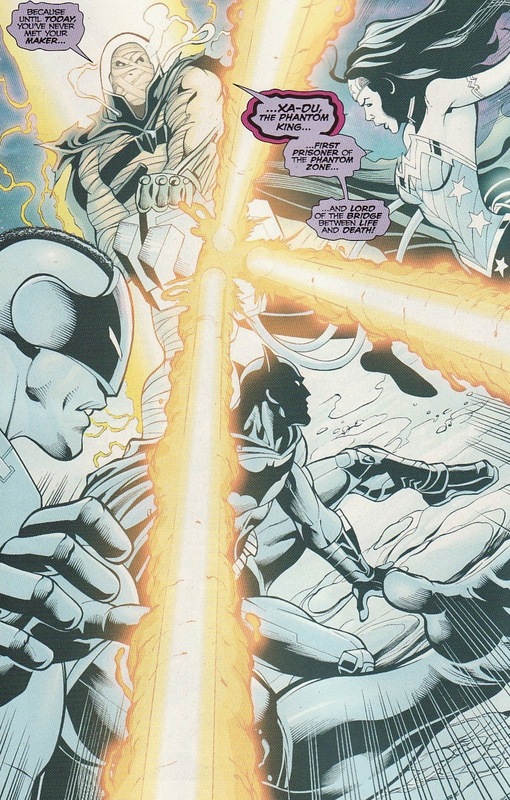 In the meantime, Steel had to keep Non from escaping the Zone through the portal while keeping it open to let Diana and Bruce (with Krypto and Xa-Du) return. 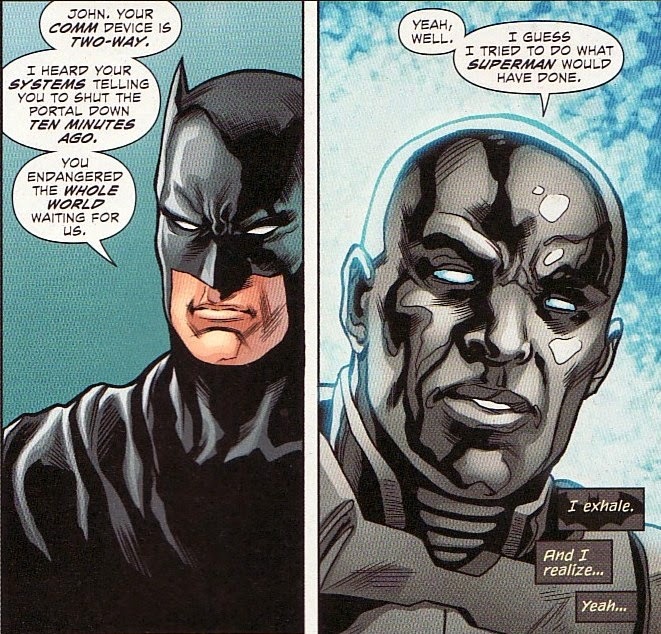 Batman actually chastises Steel for endangering the world by keeping the door open. When asked, Steel responds simply. It is what Superman would have done. Three heroes ... all influenced by Superman. All willing to risk their lives to save Superman. Fantastic. 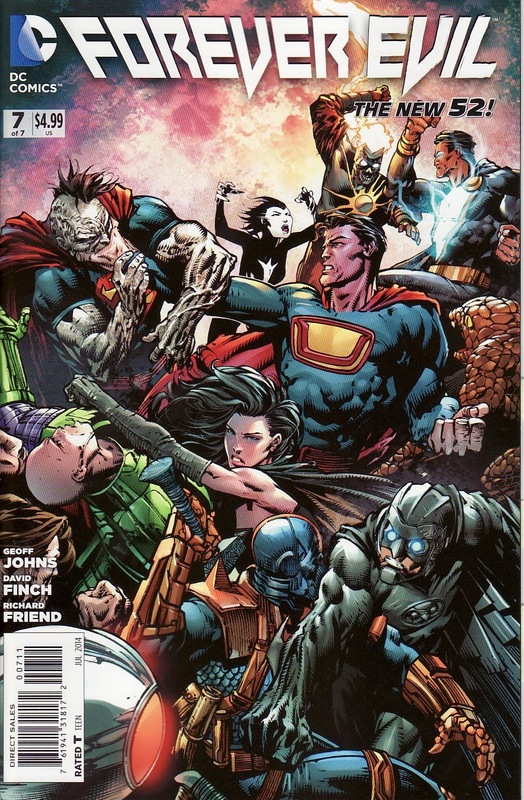 I think of Funeral for a Friend, the story after the original Death of Superman Doomsday story. That arc showed how much Superman was revered, how his death effected people. This reminded me of that a little. Superman is sick, dying, in peril ... and these heroes realize what he means to them and everyone else. So this was a good chapter in Doomed, moving the story along, raising some new subplots, and showing how important Superman is. This wasn't a jaw-dropping issue. But it was perfect for a third chapter. And it was very good. And when a sick Krypto recovers and we learn how to cure Superman from his dog ... well remember you read it here first. I think Greg Pak has a nice handle on Superman. I am glad he is on the super-books. Since the New 52 has been introduced September has been DC's gimmick month - zero month, Villain's month, and now Future's End month, complete with 3-D lenticular covers! Last September, Supergirl didn't even merit an issue. 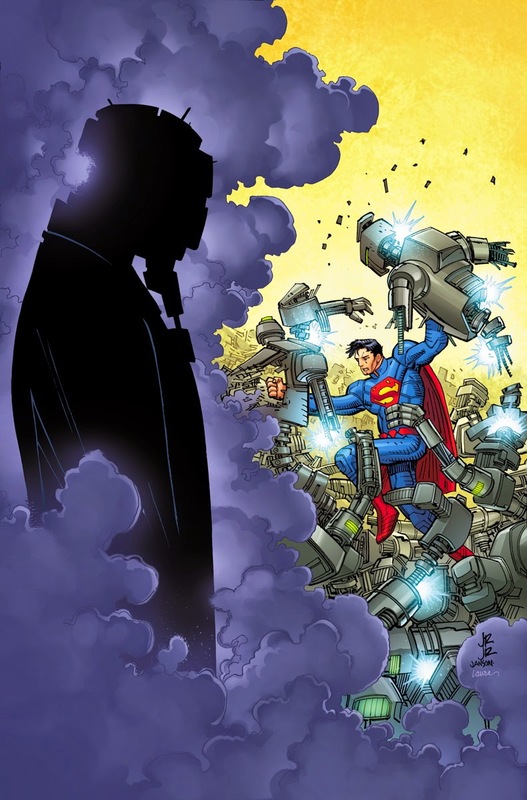 Cyborg Superman, the 'Supergirl' villain, was part of the Superman title's issues. Well, this September's issues include a Supergirl issue! Here are the complete September solicits from over at CBR. Well now we get to see the cover. And boy it is a beauty by Giuseppe Camuncoli. There's a sort of Art Thibert feel to it. And Supergirl looks fierce. In Metropolis no less. I know I shouldn't assume anything from a comic cover but Supergirl in Metropolis albeit 5 years later. Maybe she really has patched things up with Kal. But what about the 'other' cover? 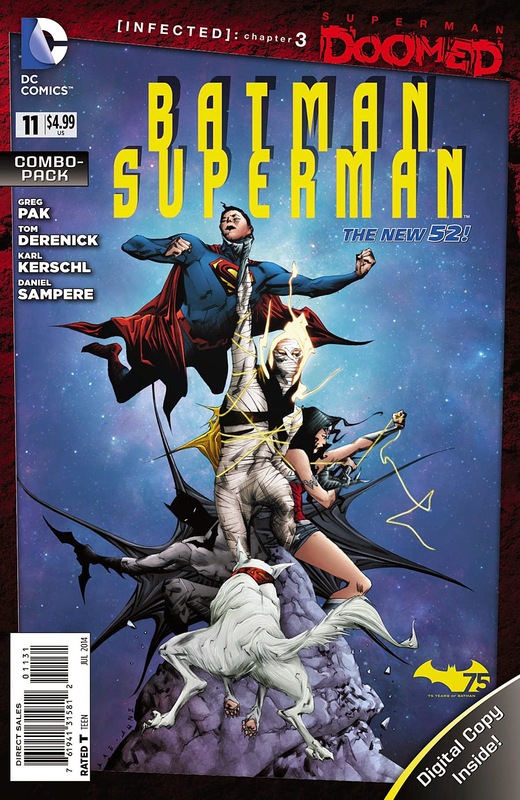 The solicit discusses the return of the Cyborg Superman. 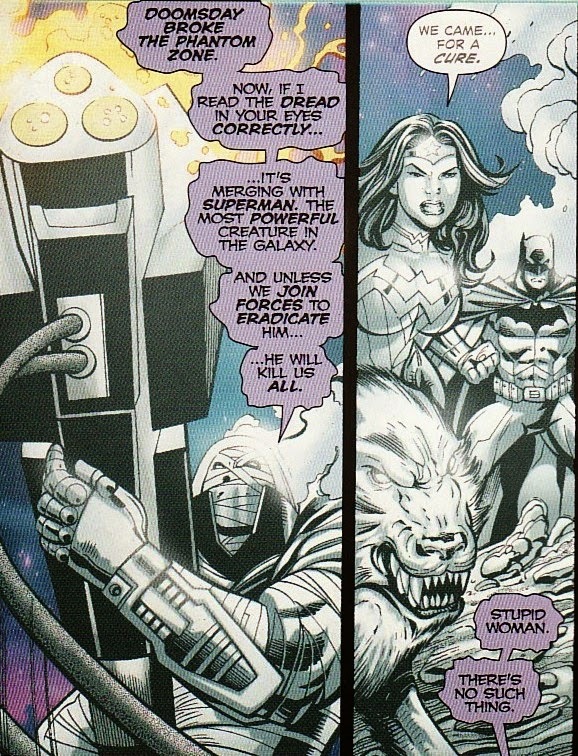 The horrific way she reconciles with Zor-El is to become Cyborg Supergirl? Well, I hope that isn't the story and would be something of a step backwards to whatever progress Supergirl would have made. That said, who the heck knows what life is 5 years later in the DCU. At least she gets her own issue and special cover. And that first cover is great. 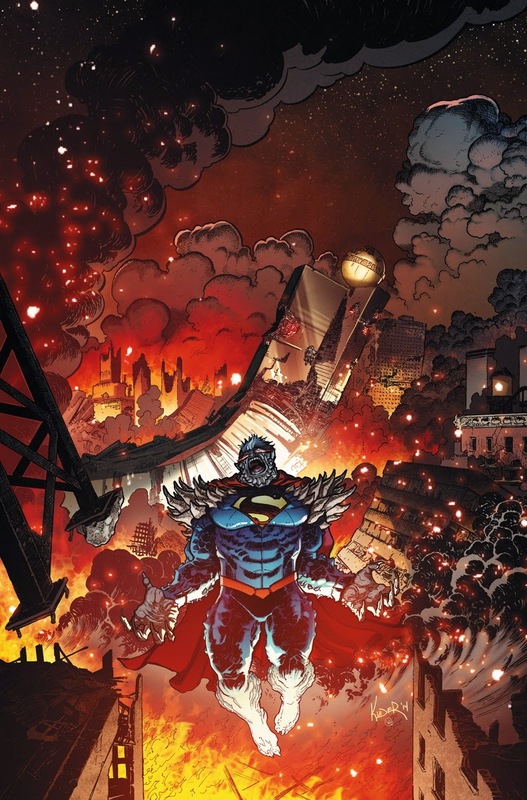 Forever Evil #7 came out last week ... finally ... ending a company-wide crossover that plodded along, full of sound and fury, signifying nothing. There were many reasons why I didn't enjoy this book or feel invested in it. Maybe it was the chronically delayed nature of the book. Maybe it was the overwhelmingly violent tone of the book. Maybe it was that it really felt like Geoff Johns fan fiction, a DC company wide crossover where the majority of the hero characters were stuffed into Firestorm. Maybe it is because there seemed to be no ramifications in any of the ongoing monthlies that for a period of time villains devastated the Earth. Maybe it is because ....AGAIN .... Batman seems to be invulnerable, having slipped through the grasp of the Crime Syndicate while immensely powerful heroes with planet-shaking skills are trapped. But most of all, it is because this whole book was done to make villains and evil seem necessary, desired, or hip. 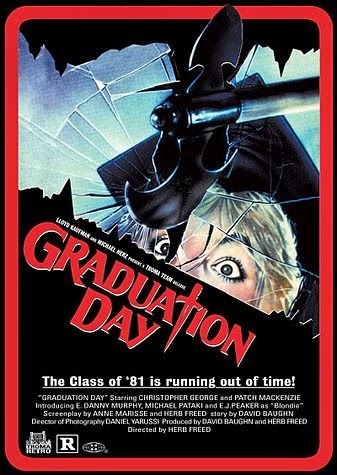 The tagline was that 'Evil is Relative' and maybe that is true. But I don't think I want to cheer for Black Manta as we get a whole page of watching him stab someone to death. And, the big player in this idea was Lex Luthor, a character that Geoff Johns early on described as a good man trying to help humanity. At the time it reminded me of Al Pacino's speech at the end of The Devil's Advocate. Playing Satan himself, Pacino gives a rambling speech that he is the ultimate humanist, only giving mankind what they deserve. 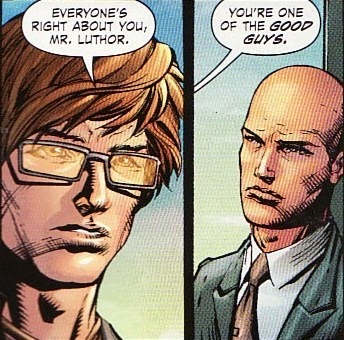 Lex Luthor ... the humanist? Let's see what our new super-hero does in this last issue. Amongst all the death and destruction he has wrought throughout the series, here was the final chapter. Lex kills his evil doppelganger Alex Luthor by stabbing him in the chest with a mystic lightning rod and then literally rips out Alex's heart. And then a couple of pages later, he crushes Atomica, killing her. This is the person that Geoff Johns and DC are promoting as their latest hero. 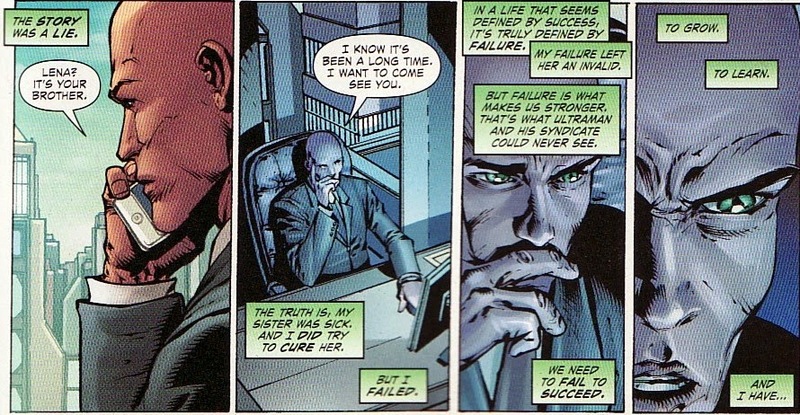 Perhaps recognizing that it would be hard to portray this cold-blooded murderer as a hero, Johns tries to soften Lex at the end. He performs life saving surgery on Superman. And he doesn't buy out and take over Kord Industries. Wow ... isn't he grand? And then he calls his estranged sister Lena. She isn't dead after all, just paralyzed from Lex's attempts to cure her. Her want to grow and learn. I don't know if I need to read a redemption story about Luthor. I don't think I am going to cheer for a guy who I have seen kill people, viciously, for the last year - throwing assistants of skyscraper roofs, ripping out hearts, blasting people, etc. So not taking over a business and finally calling your ill sister isn't exactly going to erase all that. I just have to realize this isn't a DCU that I am going to be comfortable with. It's funny. I didn't have this problem when Lex was named President way back when. Back then we knew he was still a villain, just one a position of power. And, of course, the heroes were brighter back then. By making the heroes darker and then painting the villains as heroes, all DC has done is made this whole place gray. Hopefully this won't last too long or encompass the whole universe. I'll be away for advanced schooling starting today which means I might not be able to respond quickly either here or on Twitter. The good news this is the last week for this particular course so I will be 'graduating'. The other good news is between reviews, planned back issue peeks, etc I will still have a week of material here. But Wednesday's comics won't be purchased until the weekend. So no new reviews until early June! I am an addict of the dollar box at my local comic book store. Any time I can, I pick up issues of the late 1980's Secret Origins book. I have been enjoying these Post-Crisis retellings, some more retread than reinvention ... but all fun. 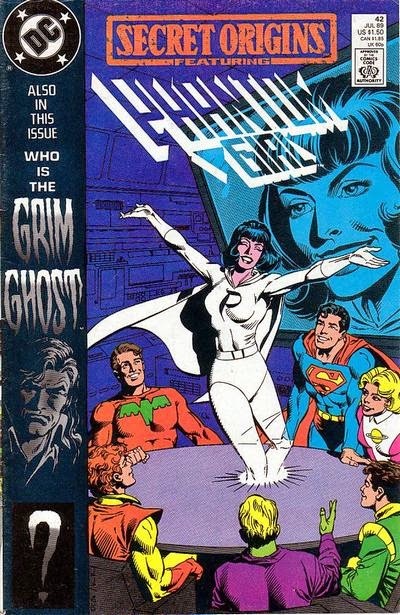 Last week I came across this Phantom Girl issue, an origin story with art by Dave Cockrum! For a $1! Anyways, Tinya's origin story was fine. And The Grim Ghost back-up story was beautiful with lush art by Michael Bair. But the thing that really grabbed me in this issue was the informational text in the letter column by editor Mark Waid. So this is Waid describing the character of Phantom Girl, her long tenure in the Legion, her love of Ultra Boy, her bright and cheery disposition. And as a Tinya fan and a Legion fan I thought this was great. But it reminded me of a darker time. It reminded me that as much as I complain about the way Supergirl is treated these days, it is better than what was happening in 1989. 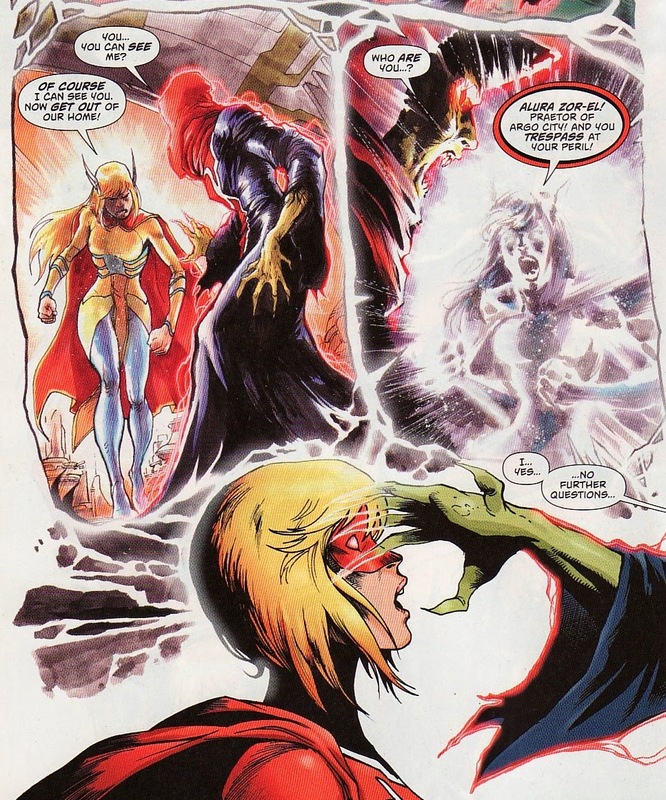 Because there was a time that Supergirl was like Voldemort. She couldn't be named ... not even in a text piece in the back of an issue. Waid ... maybe cheekily ... calls her S*p*rg*rl. As if reminding people that there was a Supergirl at one point in the DCU was forbidden. Anyways, I should remember that there was a time Supergirl wasn't around in any form. At one point Kara was 'She Who Shall Not Be Named'. As for that issue, I reviewed Action Comics #276 4 years ago, the issue where she joins the Legion, the issue which introduced a gaggle of Legionnaires including Braniac 5. So next time I complain too loudly about angsty Supergirl remind me about S*p*rg*rl! 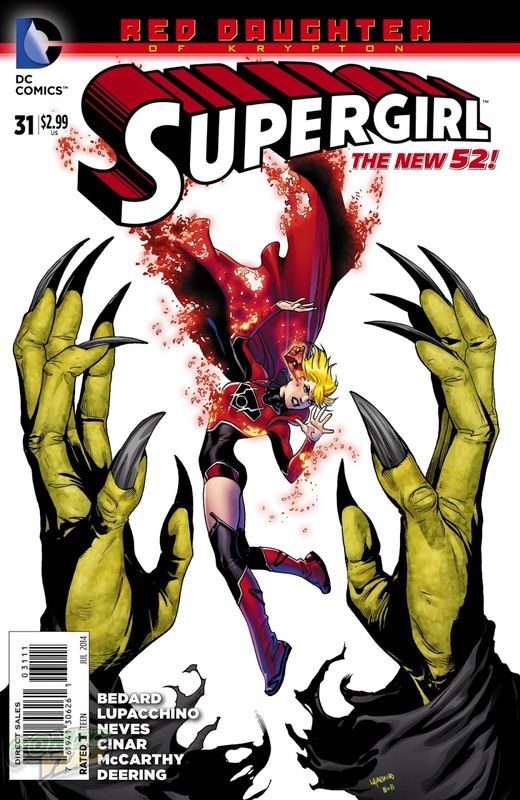 Supergirl #31 came out this week and continued the recent pattern of excellent issues on this book. I am amazed. As I have said for a while here, I was against the whole concept of Red Daughter. 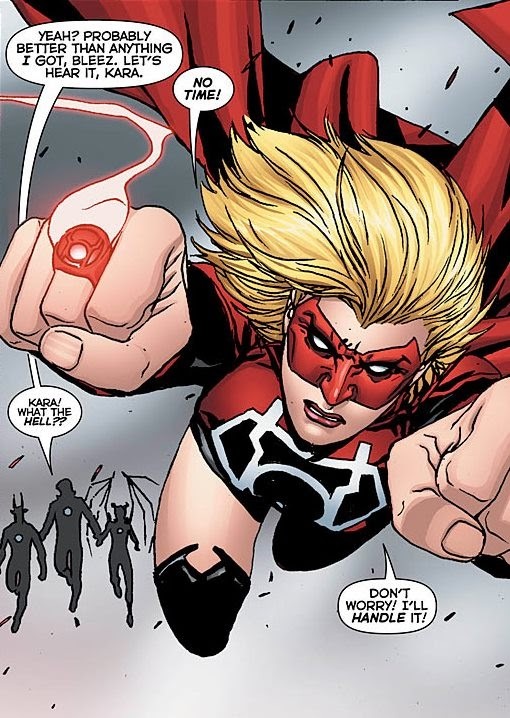 Making Supergirl a Red Lantern seemed like an affront to the decades of history she has. It also seemed like dragging her down even further into the miasma of anger, isolation, and angst that Scott Lobdell and Michael Alan Nelson had left her. It shouldn't have come to this. All that said, writer Tony Bedard ... from the very beginning ... said that this was going to be a transformative story, making Supergirl relatable, likeable, and heroic. And so far he (and Charles Soule on Red Lanterns) has done just that. Maybe, like Elsa in Frozen, Kara just needed some distance to make everything seem small ... to get a handle on her issues. Because suddenly, despite the rage ring, we are finally seeing some glimpses of a young hero wanting to do what's right and figuring out how to accomplish it. There are a couple of fantastic moments in this issue that dramatically show us this. The art here is primarily by Emanuela Lupachhino and she is growing into the character with each issue. But the winner art here is by Yildiray Cinar who does 3 amazing pages in this issue which simply sparkle. Something that I have liked about Bedard's run is that we suddenly have the simple building blocks of a good comic title. Things like a supporting cast and subplots are vital for a book, to keep readers interested and add depth. 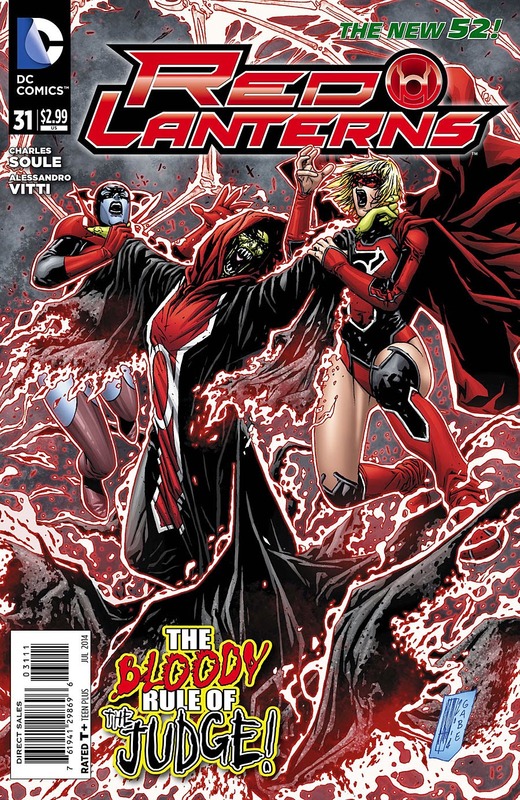 So while Kara is away on Primeen, dealing with the new Red Lantern The Judge, Bedard brings us back to Earth. Siobhan's roommate Alexa, a suspicious young woman who seems to be tracking the Banshee, decides to play with a Ouija board. The board summons Blaze who seems to want Supergirl. There was something about this scene that felt like a classic B-horror movie. I actually liked it. 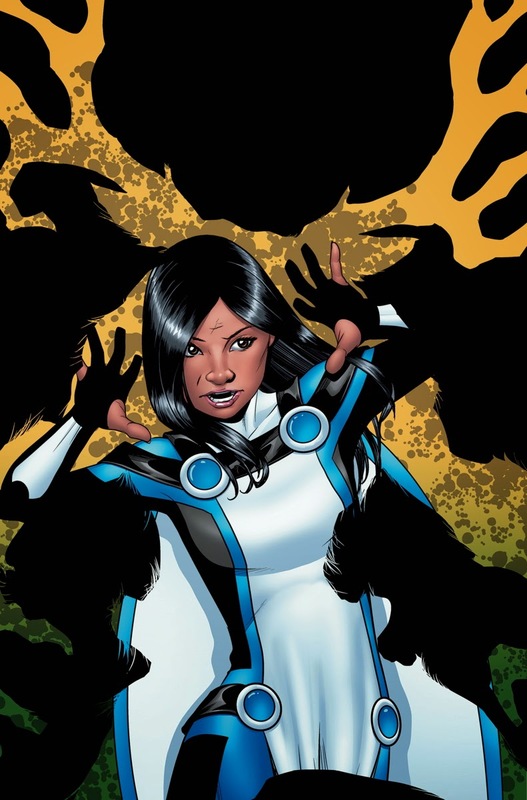 I don't know why Blaze would need to be summoned since we saw her walking around Queens last issue. Unless she thinks that a dramatic entrance might lead to more info. I also like that Siobhan walked out as soon as the Ouija board was brought out. Why fool around with demon-y stuff. The bulk of this issue is on Primeen, picking up right where Red Lanterns left off. The Judge is wreaking havoc over the planet. Atrocitus is tracking her down to recruit. 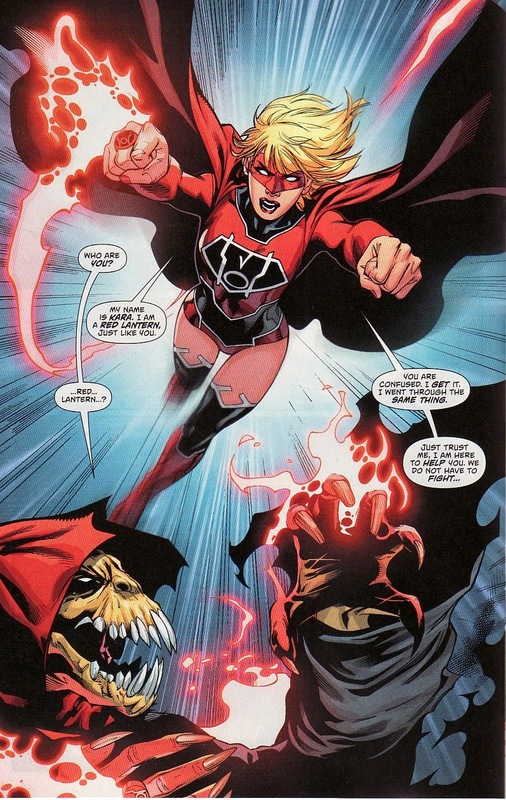 And Guy's group wants to intercept her before Atrocitus and Dex-Starr lure her to the dark side. The good Reds split up to cover more land. Kara and new friend Bleez fly off. But Bleez is still recovering from her recent thrashing. She can't continue. Supergirl says she can search the place at super-speed and report back to Bleez. It would be more efficient. But Bleez sees through it. This is Kara being NICE! This is a way to help Bleez to recover but not be insulting. And Bleez sees through it ... but appreciates it. So Supergirl isn't angry, doesn't snap at Bleez. Instead she offers help in a way that isn't condescending. It is great. As wonderful as that moment is, I think this is my favorite moment. Supergirl is the first Red to run into The Judge. Her words are fantastic. "My name is Kara. Just trust me. I am here to help you. We do not have to fight." I am here to help?? We don't need to fight??? That is pure classic Super-dialogue. And it is fantastic to hear Supergirl say those words. 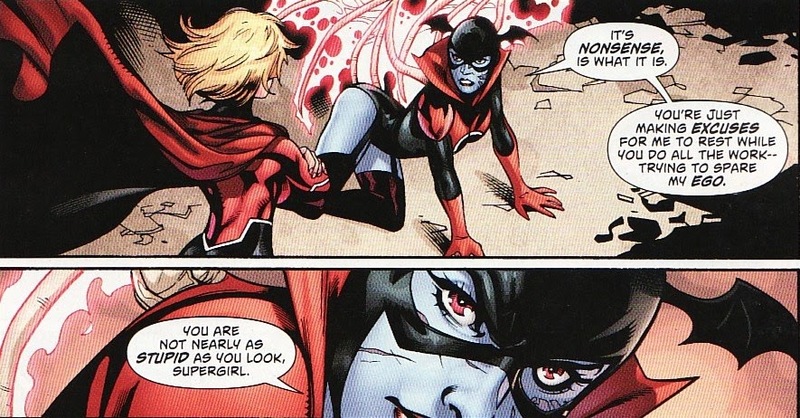 I don't know if I have ever heard Supergirl talk like that in the New 52. She is often punch first, ask questions later. If this is the sentiment that Bedard is bringing to the character, I will be thrilled! I have to add that this is a great great splash page by Lupacchino. Just a wonderful iconic heroic position. Okay, that last moment was great. But maybe this is my favorite moment of the issue. The Judge actually psychically judges her victims, seeing their lives, their memories. She witnesses their pain ... and finds them wanting. 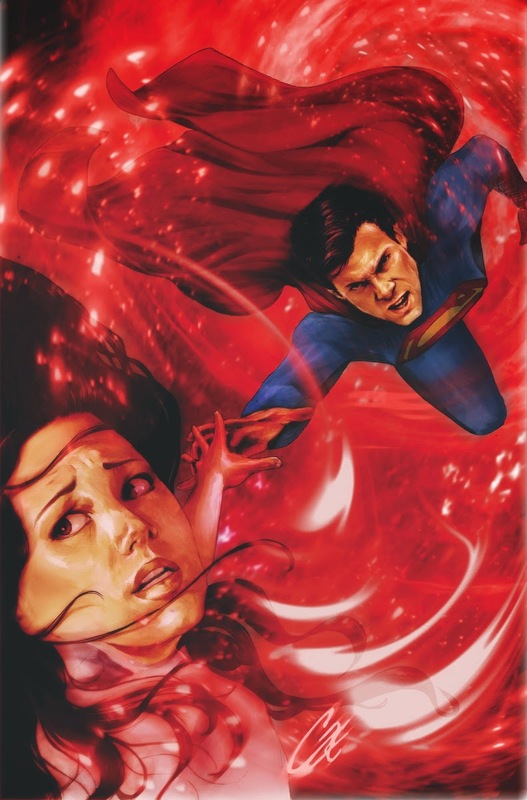 She delves into Kara's mind and sees the horror - the destruction of Krypton, its re-destruction in Krypton Returns, stabbing H'El, fighting Superman - that this title has put on her. In fact, those are some of my least favorite moments in this title. But then ... suddenly ... there is a ray of hope. We see a memory of Zor-El and Alura. 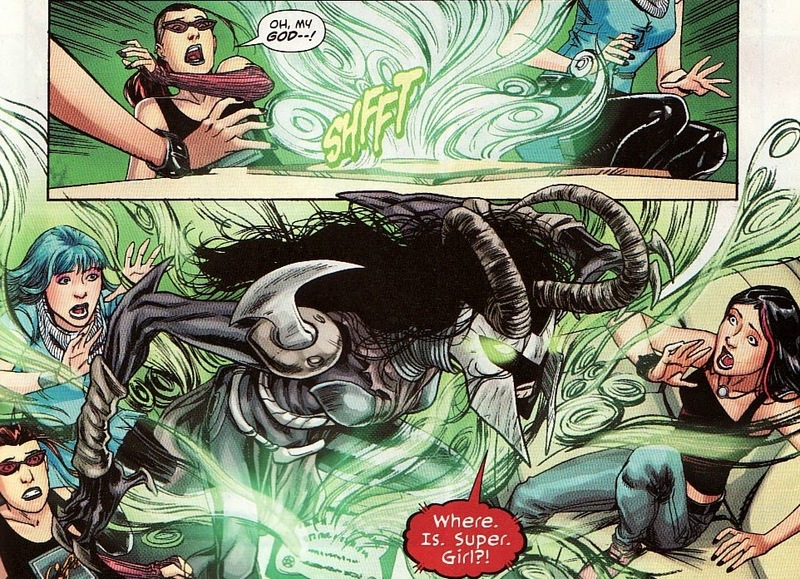 And within that memory, Alura sees the judge and leaps to Kara's defense. There is this blinding power as she tells the Judge that she cannot trespass in Kara's mind. And that mental defense breaks the judge's hold. I love that Alura is this powerful part of Kara's life. That she is this role model of strength, someone who defended people. And that the memory is so strong that she somehow can deflect the Judge's probe. Incredible. And Cinar's pages are gorgeous. The art seems more like pencil sketching, less defined - perfect for memories. And the fractured panels add to that dream-like state. But that last panel, a stellar strong Alura is simply fantastic! Somehow that memory, that defense from Alura, is enough to have the Judge spare Supergirl! This Lantern has killed everyone she has run into, finding everyone wanting! And somehow she sees Supergirl as someone good ... someone who should not be killed. Now that is Supergirl! And Alura is the brightest facet of Supergirl's identity. I think that is great. Certainly it is tough to like the current Zor-El. This whole scene with the Judge ... Kara trying to help, not wanting to fight, being defended by Alura ... is pure gold. And look how it comes to a close. Kara still wants to help the Judge. She remembers the blood lake sample on the ship. She asks the Judge to sit tight so she can help her. She's smiling!!! She wants to help!!! This whole scene ... heck this whole issue ... was a breath of fresh air. 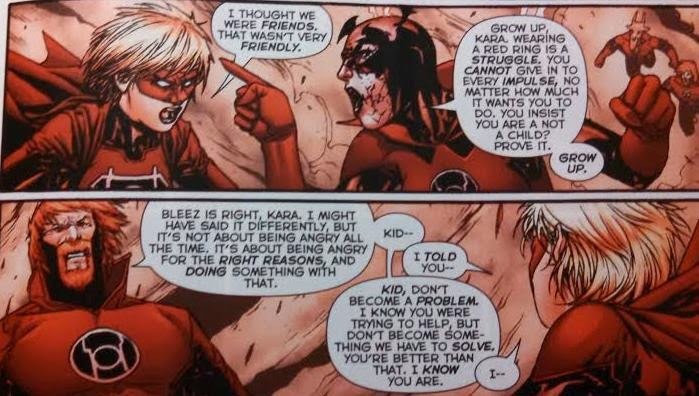 Why did it have to come to a rage-y Red Lantern arc to get Kara back where she belongs??? But there is more happening than just the action Primeen and Blaze. 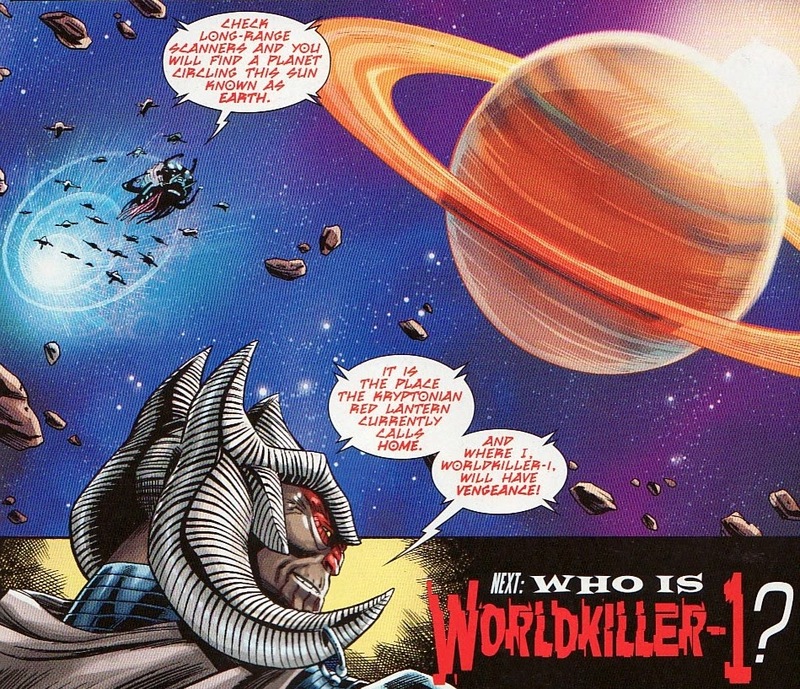 Worldkiller-1 is on the hunt for Supergirl and that brings her and her troops to Earth's solar system. So another subplot simmers. 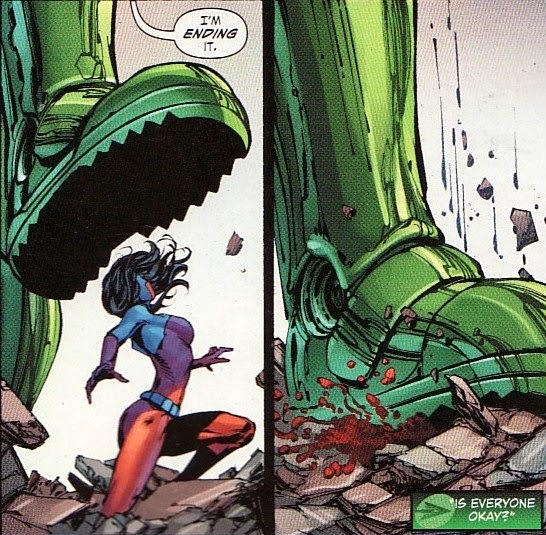 And I'll remind people that Supergirl isn't Worldkiller-1, something hinted at by Mike Johnson and Michael Green. Tremendous. Okay, I am gushing about this issue a bit too much. But the truth is this felt like a more classic take on Supergirl. Take off her Red Lantern togs and put her in a classic S-Shield and this would have been perfect. Tony Bedard, so far, has been keeping to his word and making this arc a redemption story. And, while a long time coming ... and sad that it had to come ... I have to say I am eating it up with a spoon. Add to that Lupacchino's beautiful clean art and Cinar's more ethereal take on memories and you have a winning issue. Hurrah!